Studio 5380: You are my shining star! I hope you've been having a wonderful weekend! I've had a nice, peaceful weekend around here. A bit of shopping, a bit of crafting and a lot of eating out - perfect! * I used the cardboard from the back of paper stack to create a base for my bookmark. * I covered the bookmark (front and back) with a dark yellow cardstock, then a smaller, lighter shade of yellow that I embossed. * Those sweet stars are from the Peachy Keen Stamp Club set PKSC-14. I stamped the stars onto the SVG file that I cut from white cardstock. 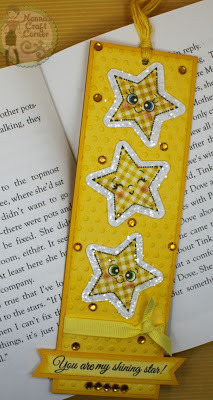 Next, I stamped the stars again onto that sweet yellow gingham paper, adding those adorable little faces. * After coloring the facial details, I covered the white portion with Glossy Accents and coarse glitter. * The sentiment is also from the PKSC-14 stamp set. * I added a few yellow gems for some sparkle and a bit of embroidery floss for a tassel. And there you go...a sweet bookmark for a sweet girl! 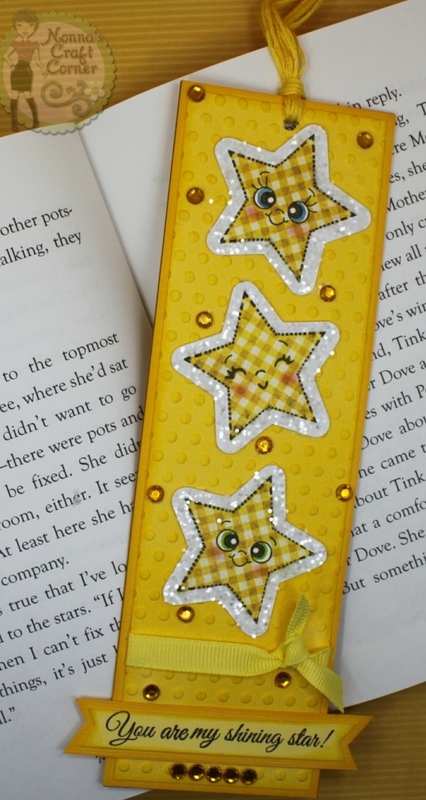 What a cute and fun bookmark. Love the colors and sparkly stars and of course those faces are off the cute radar. I LOVE this adorable bookmark!!! What a fun thing to look at every time you open and close a book!!! Thanks for sharing and have a GREAT night!! Super Bookmark. I need some for my students. What a fun book mark. Love all the cute faces. This is so sweet! I'm sure Emma will be delighted! The faces on the stars are fabulous and I love the glitter and gems! 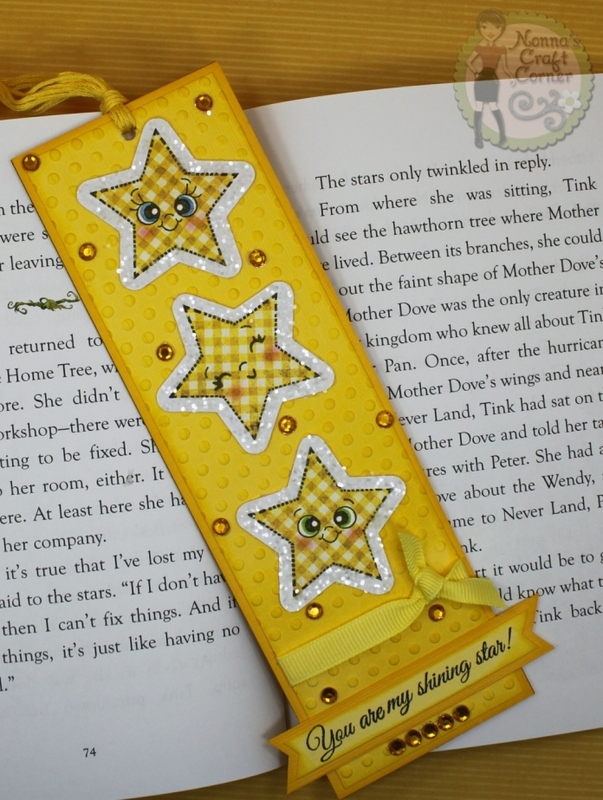 What a bright and cheerful bookmark! This is adorable! Love it, especially the bright yellow color scheme! Cute, cute bookmark. Love the color and those cutie-pie faces. These little stars are just too cute, love how you used the pattern paper and LOVE the sparkle!! Oh Tanya ~ this is such a PERFECT bookmark! I LOVE the stars and the thiny parts! Oh I bet Miss Emma ADORED it! Again the BEST Nana EVER!!! Oops I meant Nonna! Poop! Related to the above comment! LOL! Hugs!